We as mix engineers are afforded some great luxuries when mixing drums, as we have plenty of options at our disposal to positively manipulate sounds we are given. If the multitracks we are delivered include drum recordings that were created in a less-than-ideal tracking environment, with sub-par recording technique, poorly tuned or dilapidated drums and cymbals—or even feature an unpolished, sloppy drummer—there are plenty of techniques to get our mixes sounding great. One of these techniques involves augmenting the original recordings by adding layers on top, or by replacing them with sampled drums. Now, let me clarify: I would prefer not to have to deal with any of these problems, and rely on augmenting the original drums with samples; very few things make me happier than pristine recordings of great performances. But for the cases when that’s not what I’m given, blending in samples is one of my frequent go-to strategies. When layering, I usually prefer to work with only 1-3 separate kick and snare sounds, but there have been mixes I've worked on with upwards of 10. That may sound like overkill, but that’s sort of the point. All of these samples most likely won’t be present and blaring throughout the entirety of the mix, but layering multiple sounds to work together as one can get overwhelming unless you approach it the right way. When augmenting drum recordings with samples, I listen critically and then determine what the original recording is missing, find samples that provide those qualities, and lay them on top. This could be any number of things; for example, perhaps the tone or pitch of the existing drums are clashing with the rest of the arrangement. First things first, I want to make sure that the drums are sitting correctly, tonally speaking, and sounding as if they are properly tuned. To accomplish this, I can re-tune the drums with Torque to get to an ideal starting point. Pitch is a too-often overlooked component of drum sounds, and Torque allows me to fix what the drummer and recording engineer may have missed. Additionally, I find that while music producers often make great aesthetic decisions when recording drums or layering samples, they don’t pay enough attention to the phase alignment of the sounds. To solve this, I use InPhase to ensure that all samples are working well together. This is an often underappreciated practice when mixing; many problems involving punch, tone, and clarity can be improved simply by making sure that your drums are in phase. Part of what we love about drums is how they interact with the environment in which they are played. Low budget recordings may have been created in a small or poor-sounding room. In this case, I search through my collection of samples and virtual instruments, and try layering it with each individual recorded hit until I find something that creates the size and space that was previously missing. In addition, defining the space with reverb can accomplish much of the task of adding what’s ‘missing’ to a drum recording. Keep in mind that historically, engineers also used means other than an actual physical room to create a sense of space in recordings. I’ve found that the Abbey Road Reverb Plates to be a versatile tool when developing a sense of space for my drums, particularly snare. H-Reverb is great for creating a less traditional space for your drums to sit in, and if I am hoping to emulate an already existing environment, the IR1 Convolution Reverb helps me get there. Space is often quite important when determining the style and vibe that your production will be, so I try to determine which type of space I want my drums to sit in early on. It can be a challenge to get drums to “sit right” among the other elements in an arrangement, and a large factor when getting drums to work in context is nailing the tonal balance of the close-miked drums. Equalization is a great first course of action. Generally, when attenuating frequencies from drum recordings, I reach for a more “surgical” equalizer capable of making very narrow cuts at specific frequencies. The H-EQ Hybrid Equalizer is a great option for this application. While many engineers process in an order they see fit for the situation, more often than not I perform attenuation using an EQ before any other processing on my drums, because I don’t want to have the unwanted frequencies triggering any subsequent processing. For something heftier and forward, any of the API Equalizers can do the trick. I especially love the 16k band on the API 560 when making a snare drum or toms cut through a mix, particularly when the arrangement is dense and has a lot of high frequency content already happening. For a more vintage tone, the REDD or EMI TG12345 Channel Strip can add a lovely saturation that recalls a familiar sonic quality of my favorite recordings of past decades. These plugins are modeled after equipment designed and used by the legendary Abbey Road staff; and being able to reproduce these tones while working in the box is a Beatles-lover’s dream. Adding saturation to drums works really well in parallel, so that a blend of the original and the saturated signals are both heard. It sometimes works well to bring up the saturated signal in the choruses to add some extra excitement and liveliness throughout the mix. Don’t be afraid to really crank the drive on the TG12345, and blend it to taste so that a certain piece of the kit like kick or snare can really cut through. I believe that analog emulations have become so popular because there is something missing from pristine digital audio. For decades, engineers actively worked towards achieving the purest, cleanest signal imaginable. As we got closer to it, we realized that (to an extent) we missed the hiss, the flutter, the harmonic saturation of the gear we’d been using since the advent of recorded sound. For even further control over tape saturation, the Abbey Road J37 Tape is great. I love experimenting with the 3 different tape formulas until I dial in the exact vibe I’m hunting for. Similar to the Kramer Tape, this can be used to add subtle warmth or sheen, or to achieve a full-out blistering crunch. Essential in getting a mix up to commercial quality is achieving just the right amount of impact and punch with your drums. Some samples or virtual instruments might have compression already committed to the recordings, but I prefer being able to apply my own to the dry signal. Compression is highly program-dependent, meaning that it will behave differently depending on what type of signal you run through it. This is especially apparent when compressing drums, as the sharp, fast transients can make a compressor behave in an unwanted fashion unless you understand the different controls, and how they all work together. There are also so many great emulations of classic compressors out there, and each of them behaves differently. My favorite drum compressor is the dbx 160 Compressor/Limiter. Part of what makes it so special is that its controls are actually somewhat limited. There are no dedicated controls for the attack and release times, so you get what you get; and it works great in most situations. The dbx 160 makes quick work of virtually any kick or snare track that runs through it. This compressor has the habit of removing low end the harder you push it, so if you want to tame the subby frequencies of a kick drum, this is a great application. The plugin version of this unit also has a high pass sidechain feature if you want to preserve low frequency content. It’s important when mixing multiple drum samples together to understand that not all of the layers can be at the same level; you’ll need to choose 1 or maybe 2 to really feature to make up the fundamental sound of your drums. I find that the dbx 160 is the compressor that I most often use when sculpting the dynamics of my on-top, 'featured' drums. Drum room or ambient signals can be a lot of fun to work with, and when compressed correctly, can make the drummer seem as if they were hitting with more intent and energy. It’s hard to beat the CLA- 76 Compressor/Limiter for this specific application. Simply dial in fast attack and release settings, choose your desired ratio (all-buttons-in mode is fun for pushing your drum rooms), and then drive the input until you achieve the desired effect. When compressing this way, don't feel pressed to achieve a specific amount of gain reduction, but rather listen for the introduction of explosive qualities to the signal; I find the “Bluey” Revision is much more colorful and intense sounding. Most important when applying compression to drums is knowing when to push compressors really hard, and when to be more conservative. A decent rule of thumb when you want to preserve the transient information of a drum is to use a slower attack time, combined with a relatively fast release so that the compressor is allowed to “breathe” along with the rhythm of the song. Transient shapers are a great way to make sure that your percussive sounds are cutting through the right way. 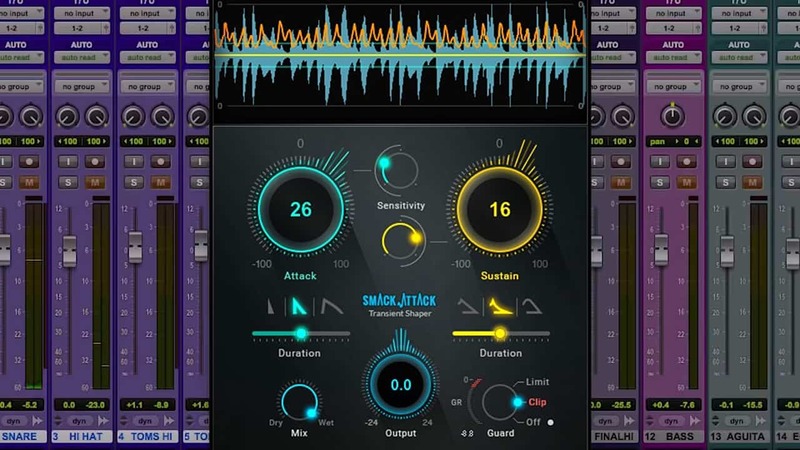 For a more modern, in-your-face drum sound, Smack Attack allows for a great amount of control over the attack and sustain of your drums. Sometimes, laying in a sample with the attack greatly accentuated, but very little low sustained frequency content can really aid in making your kick, snare, or toms seem more present and impactful. Once I’ve dialed in the sounds of the individual drums using the aforementioned processing, I make fine-tuned adjustments to levels using volume automation. From there, I switch from looking at my drums through a microscope and take a step back to view how they fit within the bigger picture. When I mix a song, I create auxiliary tracks for the several different subgroups that make up the arrangement. This includes one for all drums and percussion, one for melodic instruments like bass, guitar and keys, and a separate aux for my vocals. I then route each and every one of my individual tracks to these subgroups. There are numerous advantages to working this way, but perhaps the most valuable is that these subgroup tracks are essential in adding “glue” to the mix. Often times, when mixing drum samples, you’re working with a patchwork of unique sounds that were recorded in different decades, in different locations, using differing techniques. These widely diverse sounds may not sound as if they exist within the same context. I may process my drum subgroup with any of the aforementioned processes so that the drums really start to sit well together, and sound as if they belong within the same mix. Again, some samples may be crudely recorded, while others may be recorded with an absolute scientific attention to detail. Often times, I want to add my own vibe to these sounds individually, and then again when they meet up together in an aux track. The Waves PuigTec EQs are one of my go-tos on drum subgroups when trying to make my mixes sound “expensive,” and I often find myself adding a generous amount of 12 or 16k to achieve a cohesive, airy drum sound. An image of the drums and percussion sent to an auxiliary track, processed with the PuigTec EQP-1A and J37 for added clarity and analog saturation. In summary, drums are essential in establishing the feeling, fidelity, and even the defined musical genre of a given production. Thanks to the method of using drum samples when creating or augmenting our rhythm tracks, we no longer need access to a great drummer, in a great room, with great equipment to achieve a killer drum sound on each and every mix. This is a luxury that we are afforded, but can certainly have its downsides in terms of tone, feeling, and cohesion. Fortunately, we have high quality tools and techniques at our disposal to achieve drum sounds similar to those that were created using more traditional means, which we have come to know and love. Purists may argue that using samples when mixing drums is “cheating”, to which I’d retort that the practice itself has actually been around for decades and was pioneered by legendary engineer Roger Nichols. Nichols, who won multiple Grammy Awards for his work with Steely Dan, invented a drum augmentation and replacement system called ‘Wendel,’ which was used as early as 1979 on the Steely Dan album Gaucho. The ‘Wendel’ system was based around a Compal 80 computer, which was fed cartridges that contained samples that Nichols made of various drums and percussion, which were then used to augment or replace existing performances when building the rhythm tracks for Steely Dan. The “Wendel 2” and “Wendel Jr.” systems were released in the following decade, and were highly influential pieces of gear used to help create the punchy, pristine drum sounds of the 1980s. 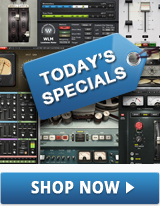 Today, a number of plugins provide even more refined capabilities than “Wendel” and its predecessors. So, to anyone that questions the authenticity of augmenting or replacing drums with samples, I’d suggest that if it was good enough for Nichols, who mixed Steely Dan’s Aja, which is still regarded by audiophiles as a sonic masterpiece, it’s good enough for me. Want to add more vintage vibe and character to your mix? 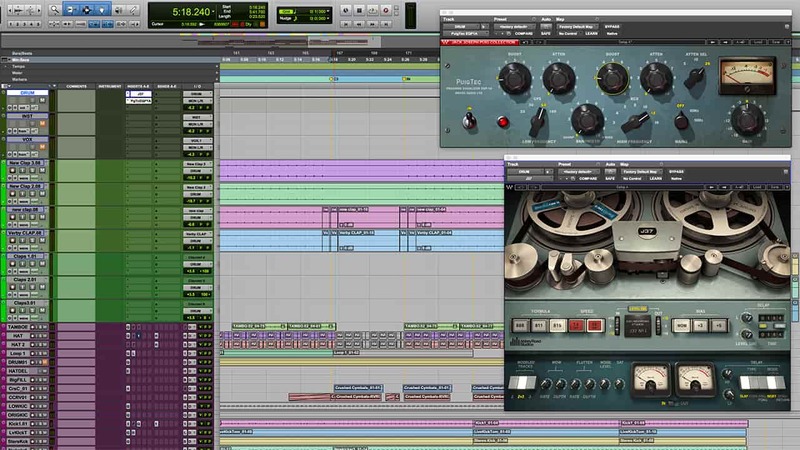 Learn about tape plugins in your DAW, and get tips for how to use them to liven up your mix. Do you have any drum sample mixing tips that we missed? Let us know in the comments below.